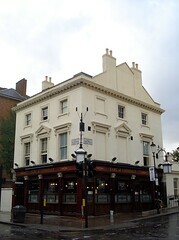 Samuel Smith's pub in Notting Hill, on the corner of Westbourne Grove and Portobello Road, and very close to the market. It has an interesting interior; ornate ceiling, bare floorboards, and a rectangular bar in the centre of the front room surrounded by a little maze of interconnected compartments divided by dark wood panelling and frosted-glass screens photo. Tiny doorways in the panelled dividers allow access from one compartment to the next. In a separate room out the back is a more open space with sofas. There's a beer garden too. Unfortunately, it has no cask ale - Sam Smith's Old Brewery Bitter is available, but not on handpump. Kake visited on a rainy Friday afternoon in September 2008, and had a half of Samuel Smith's Wheat Beer (£1.45, seemingly an exception to Sam Smith's usual cheap prices). There were very few other customers. A couple of the other customers seemed to be locals and/or regulars, and they'd occasionally jump up and call out of the doorway to a passing friend. No background music. Food is served noon-9pm Monday to Friday, and noon-5pm Saturday and Sunday, according to Time Out as of April 2008. A sign spotted in September 2008 advertised quiz nights on Tuesdays at 8:30pm. Accessibility: Shallow step up to get in, and level access to seating area and toilets once you're in (not sure about the beer garden). Toilet cubicles are a decent size too (at least in the ladies'). If you can't manage the narrow and low doorways into the snug compartments, head for the back room, which is much more spacious. Last visited by Kake, 12 September 2008. Opening hours and food times taken from Time Out website, April 2008. Last edited 2013-05-10 07:07:30 (version 12; diff). List all versions. Page last edited 2013-05-10 07:07:30 (version 12).